Steve, my brother-in-law, is a birder. He has many field guides and handbooks. 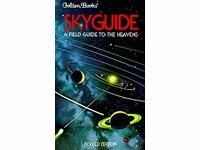 In his travels, he found a book for amateur astronomers, Skyguide from Golden Books, in the same style. He gave this to me as a Christmas present. It will prove handy, I'm sure. Wikipedia has an entry on Golden Field Guildes. I recorded from television the documentary called The Northern Lights directed by Alan Booth and narrated by Michael Kramer. It is a stirring, eerie film from 1992, short at 48 minutes, with stunning photography and a haunting soundtrack. I watch it every winter. Available from the National Film Board.